This is still more and more debated topic and many discussions are held about it. Anyone, who has ever taken part in some kind of exercise, has certainly heard many pieces of advice and tips for the top abs exercise. It is the same with the exercise for the best shaped ab muscles and best fat burner exercises…And everyone has at least one favorite exercise to torture his or her abs. Do we really need to burn the abs or the „six-pack“? Is the look more important than functionality of abdominal muscles? If you have answered „NO“ to both questions, this article is aimed exactly at you. I have created the top ten chart of abs workouts. Either with the additional fitness equipment or without, but as I see it. I do not enforce to anyone that my opinion is the only right one but it may inspire some of you in the change of training or ideas about correct exercise. Old-fashioned sit-ups focus directly on the ab muscles and you should skip them, because they are bad for your body and cause lower back injury. But there are much better exercise options – develop and improve strength and structure of your entire CORE! Try these 10 good ab exercises during your next CORE training session at home or in a gym. This exercise was typical during the period when shell-boards were used for this exercise. Except for the fact, that only a few are able to manage this exercise technically and with their power, this exercise is useless. In majority of cases, we join the muscles of lower limbs and not abs. If so, how many times in life do you use this movement? Similarly like a previous exercise, it is hard to manage this exercise with your own power. Hip flexors are joined if you want to master this movement perfectly. But if you are able to keep the lower back and pelvis in the right position, enjoy this movement. This is a very widespread and popular exercise. It is undoubtedly suitable for exercising the oblique abdominal muscles. This is true only when you are technically prepared and have enough power to master this exercise. If your abdomen is not strong enough, you will overload lower back and the direct thigh muscle together with hip flexor is excessively activated- and you do not want it. Crunch exercise is conditioned by mastering the previous exercise. When exercising TRX it is such a „classics“ that you will not spoil anything and you will relatively well exercise all abdominal area. It is similar like the previous exercise. What is more, when exercising Pike- you will join also the muscles from the shoulder girdle area. It is a great exercise for gymnasts when practicing hand spring. This is super but very difficult movement for exercising oblique abdominal muscles and spine rotators. If you dare to do it and you think you will manage it, enjoy it! 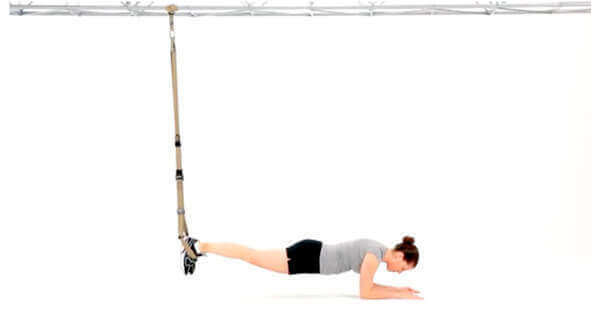 It is another from the group of great TRX workouts for strengthening core of the body. Thanks to a break in basic position after preceding side movement, you are forced to activate deep stabilizing muscles and exercise also those muscles which are very often missing in a gym. It is one of the most efficient exercising for toning of abdominal muscles. It is not only strong on abdominal muscles but also prowess and flexibility of upper and lower limbs. If you are able to exercise handstand on trapeze correctly, you can say that you can exercise. This is an absolute winner from all exercises for abdominal muscles for me. When exercised correctly, you will not only join almost all 32 muscles which participate in the function of your core, but you will also exercise breast muscles. This is the right ab exercise, if you are really looking for a way how to get a six pack. If you manage to exercise in a big angle, you will gain firm and especially functional abdomen. Another possibility how to effectively tone your abs and all core of the body is the series of unilateral exercises. We will talk next time.